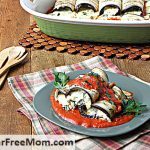 Baked Stuffed 3 Cheese Eggplant Roll Ups are a perfect dish for vegetarians and low carbers alike! 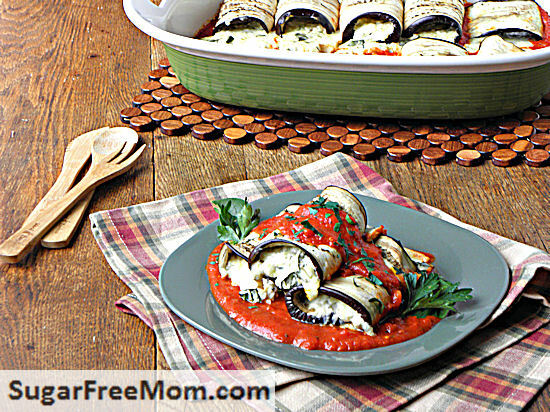 Even if you may not be a fan of eggplant, you will most certainly enjoy this cheesy stuffed recipe. 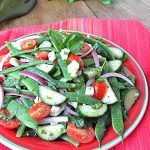 If you are a low carb-er you might be looking for other options than pasta. This dish won’t make you feel deprived in the least! 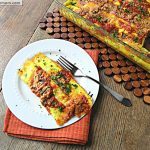 Filled with gooey goodness, rolled up and topped with tasty marinara sauce make these a perfect substitute to lasagna roll ups. If fact that’s where my inspiration came from to make this recipe. 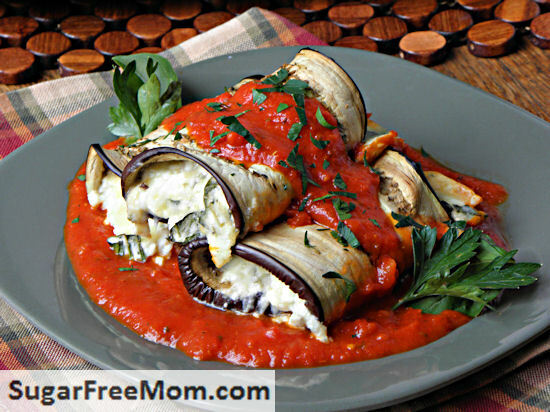 My gluten free lasagna roll ups are fantastic but having had my first garden this summer I’ve got a few eggplant on my hands. Also I’ve been lowering my carb intake lately so this was a match made in heaven. 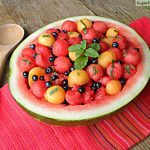 The beauty about this recipe is that, with a little preparation it can be made ahead and baked on the day you plan to serve it. No fussing when you have company, just place in the oven and enjoy your guests! 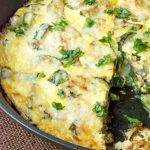 Not only is this a perfect recipe for low carb-ers, but wonderful for vegetarians and families who try to follow the Meatless Monday trend! 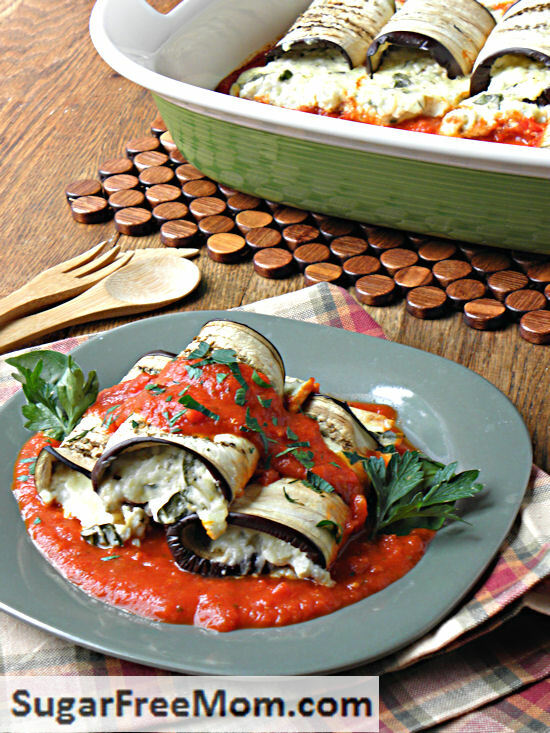 Place slices of eggplant onto a cooling rack over a baking sheet. Allow to sit for 10-15 minutes. 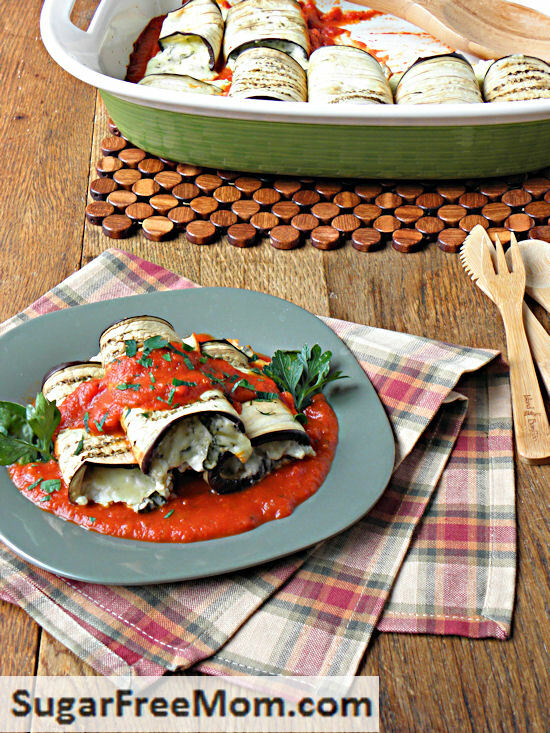 Pat dry with paper towels and bake for 15-20 minutes until eggplant is softened and bendable. 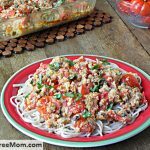 Add 1 cup tomato sauce to a 9 by 13 dish and spread over the bottom. 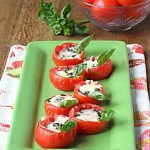 Add about 2 -3 tablespoons, (depending on size of slice) filling onto the middle of each eggplant, roll up and place seam side down onto the sauce in the baking dish. Pour final cup of sauce over the tops of roll ups. Nice one! this is awesome!!! Going to make this tonight! Could I add spinach as well? How well does this keep in the refrigerator? How thin do you slice the eggplant? I didn’t use a mandolin, just a sharp knife, about 1/4 inch in thickness.